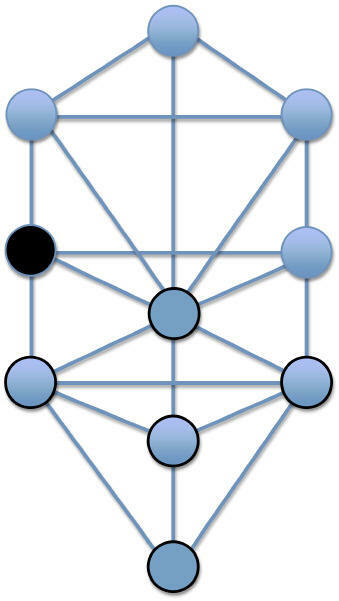 Within the Qabalistic Tree of Life, the energy of the sphere of Geburah is one of the most feared of the spheres. It is the nature of the surgeon wielding the scalpel that will excise, albeit painfully, what is no longer productive or useful for the health of his patient. It is the love a parent who turns her child in to the police for having committed a crime, knowing that this is the only lesson that will ultimately ensure that the child will not die a needless death from his behavior. It is the love that will walk away from an unhealthy relationship, broken hearted and abused, so the suffering of a cruel love will no longer hang heavy. In order to understand the nature of this sphere you must have a bit a knowledge about the Tree itself and the other spheres that form the greater whole. The subject matter of the Qabalah is one that many pagans do not easily gravitate towards, either deterred by the sheer mass of its scope or feeling that this particular overlay of system has no reference to the purely magickal systems. Although, rooted in the Judaic mystical system the Kabbalah(spelling is Judaic form)/Qabalah (spelling used to distinguish as Western Hermetic overlay) this construct of energy, thought and working is a suitable companion to any magickal system. The sheer fact that a statement such as that can be made offers testament to the enduring scope and permanence of its application over a broad and diverse spectrum. Within the Tradition to which I belong, The Assembly of the Sacred Wheel, the principles of the Qabalah are strongly and consistently used throughout all of our covens and the enhancement to the magickal workings and rituals is undeniable. This is a poem I wrote about the energy of Geburah and gives a hint to the potency and dynamics of this sphere. When we call upon the energy of this sphere we are asking for refinement of transformation and change to occur at the deepest levels of our being. We are trusting that the things that must be purged will produce positive result and we are allowing the organic flow of Geburah’s fiery nature to cleanse and cauterize what has been rendered into new form. For this week, read through the poem several times and see what images, thoughts and feelings are projected in the reading. Make note of all you experience and in next week’s article I’ll discuss more of how the “tough love” of this sphere can be applied and become part of your spiritual practice. Hi Shannon… The practice of Qabalah ( note the spelling of Q instead of K) as an enhancement of the Western Hermetic/Pagan Spirituality is not focused on the same components as the traditional Judaic construct. There are two basic distinctions between the Jewish Mystical Kabbalah and the Western Mystery system of the Qabalah. The difference in spelling is generally the first clue as to which system is being used. The Tree of Life, itself, remains the same within each; but, the approach and what energies, correspondences and analogies are made are what is adapted to become a purely Jewish perspective or one with occult roots. 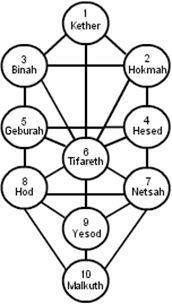 Within the Jewish Kabbalah- the 10 Sephorit are ten essences referring to the 10 aspects of the Divine God. The importance of the naming of that God and the vibration of tone and sound related to that “naming” are of most importance to this system. This is also heavily focused on the Gematria of the spheres, which is a mathematical construct. Within the Western Mystery Qabalah- the 10 sephiroth relate to aspects of consciousness, the macrocosm”, the microcosm, The Universe or the totality of creation in correspondence with the Human Being. When I teach Qabalah, I often relate to the number of the sphere in relation to the practice of numerology and the energy of the numbers 1-9 as energetic overlays to the essence of the sphere itself. Hope you find this information useful and thank you for asking questions! I think I have balked a lot from the kaballah for multiple reasons. 1 is that I am very distrustful of Judaism because christianity came from it and I have been persecuted by christians. I am curious if practice of the kaballah requires faith/trust in the god of the jews/hebrews? Another reason I have balked at it is because it’s always been presented to me in a very mathematical way, and I fail at math (I can do, if I push it, about 4th grade math–badly). Lastly, I am looking forward to next week, because the other reason kaballah intimidates me is that I have sort of been told that you have to understand it all and it will present itself in life… I’ve been given no actual “practical application” ideas on it (how ironic that I had that thought several times during your post, only to see, ‘next week, practical application’ at the bottom! ).